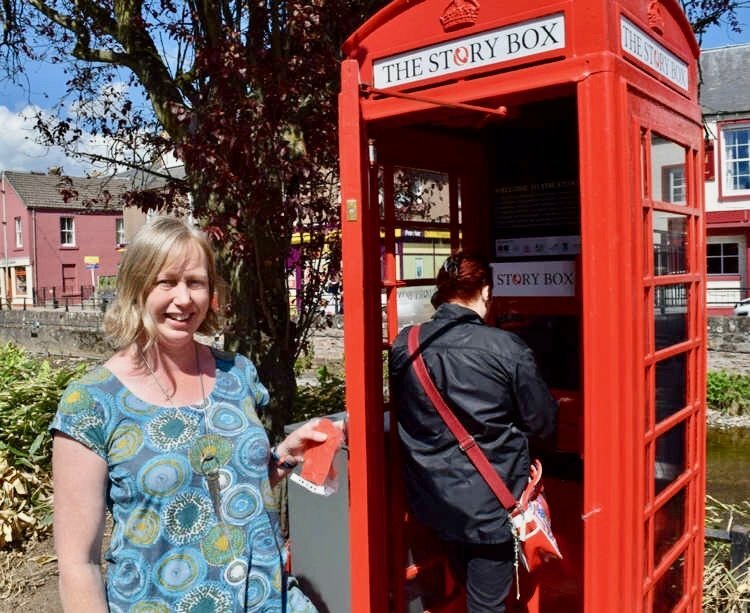 The treasure trove of stories about Alyth through the centuries currently housed in the “Story Box”, an old red phone box on Market Square, was transferred to Alyth Museum in April as the project comes to an end. The public WiFi hub in the box will continue to be available until the current BT broadband contract expires in December. Since the Story Box was opened in 2017, visitors have been able to listen to any of more than 150 recordings from around Alyth simply by lifting the receiver in the phone box. The phone box is now closed, but the electronic innards which store and play the recordings have been moved to Alyth Museum and will still be accessible when the Museum reopens in May. The recordings have also been archived in the AK Bell Library in Perth. Sound artists worked with locals to record stories and sounds from the present, oral histories from within living memory, and recreated stories and sounds from the distant past. Former residents with a keen interest in supporting the project also recorded and sent stories from as far away as Canada. The recordings include tales of the Picts from pre-history and the monks of Alyth’s 5th-century Church; the legends and myths from the area, farming life, the people, industry and shops of this historic market town. The stories also paint an audio portrait of the present-day people and how the remarkable community spirit of this town helped it survive the devastating flash flood of July 2015. The future of Alyth is told through imagined stories and songs written by the young people of the town recorded during digital and sound technology workshops run by the project in Alyth Primary School and Alyth Youth Partnership. The Story Box was part of the 2017 launch programme for the Cateran’s Common Wealth initiative (www.commonculture.org.uk) which was supported through significant in-kind donations from individuals and businesses in Alyth and funded by Alyth Community Council, Creative Scotland, The Drumderg Windfarm Community Fund, The Gannochy Trust, The Heritage Lottery Fund, The People’s Postcode Lottery Fund, Rural Perth & Kinross LEADER programme, Perth & Kinross Council, Scotmid Community Fund and the St James Place Foundation. Here to help you help our community! The three local development trusts creating the Strathmore Cycle Network have published a leaflet describing the first phase of the £1.6-million project. The leaflet includes a specially-commissioned map showing the newly-built multi-user path opened late last year, together with the “green routes” – walking and cycling friendly country lanes – recently designated by Perth & Kinross Council. The leaflet also includes useful information about the Network and background on the organisations behind it. The leaflet is being made available in various locations around the district, or you can download a pdf from here. 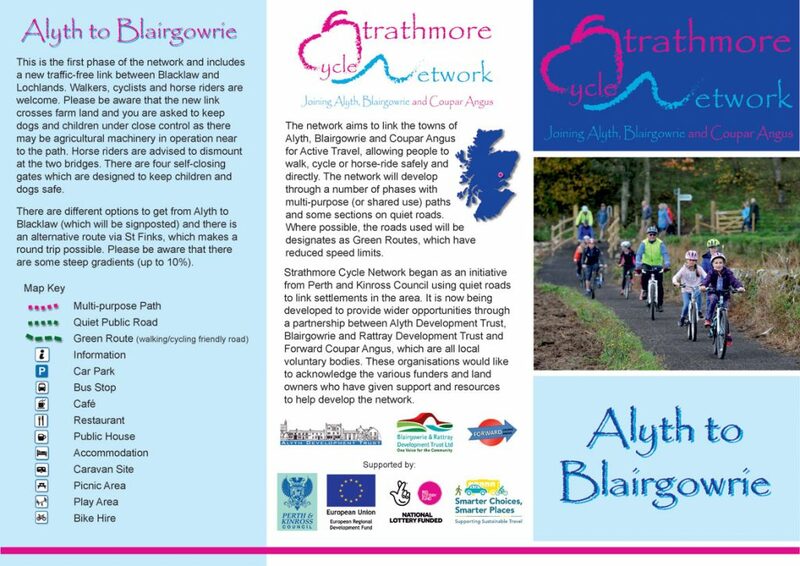 And find out more about the Strathmore Cycle Network on our Projects page. Local schoolchildren have formally opened the first phase of a new £1.6million network of cycling and walking routes in eastern Perthshire. 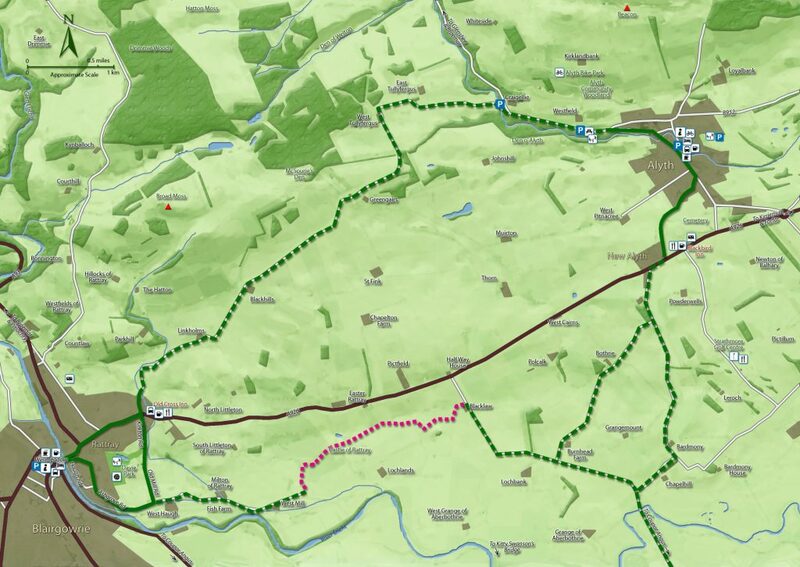 The 2.5km (1.5 miles) first phase is a specially constructed path linking country lanes between Alyth and Rattray. 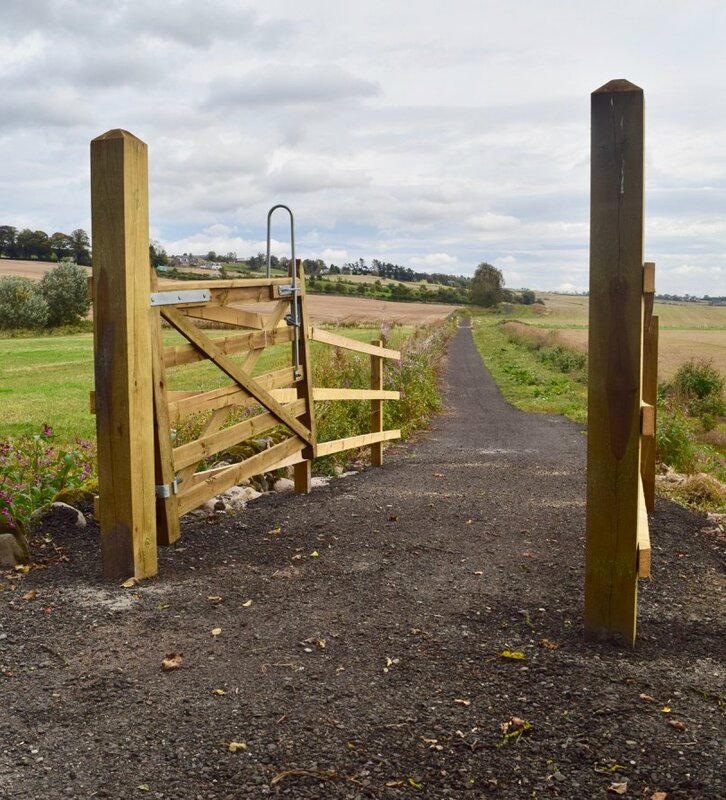 The new path is the first section of what will be known as the Strathmore Cycle Network, connecting Alyth, Blairgowrie/Rattray and Coupar Angus. The development trusts in the three towns set up a Steering Group to create the Strathmore Cycle Network, which has already raised more than £250,000 towards the total cost. Find out more on our Projects page. This is the revised masterplan for the major development being proposed for the former Glenisla Golf Course site. 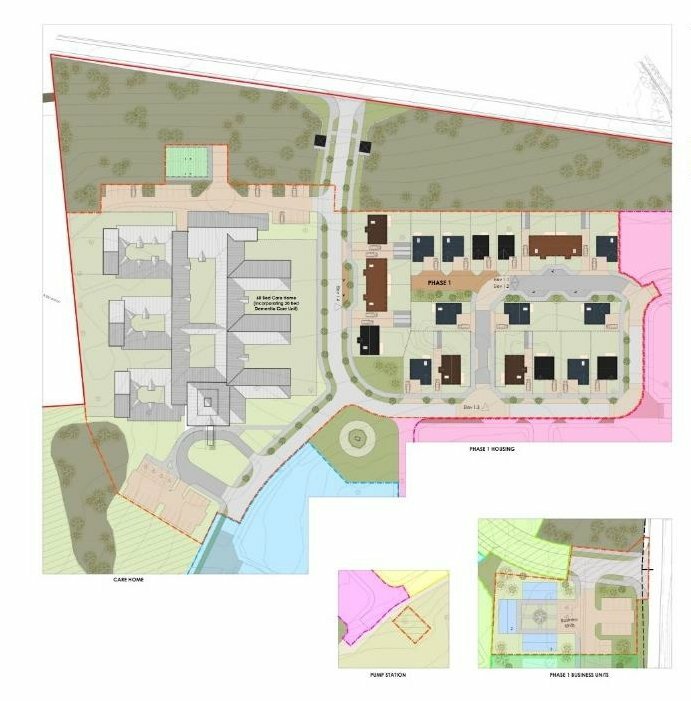 The developers have lodged this along with their application for detailed planning permission for the first phase – the 60-bed care home/dementia care unit and 20 new houses outlined in red at the top left of the plan. The first phase of works would also include a biomass boiler, a pumping station and two entrance buildings as well as a new access road from Meethill Road (seen at the top of the plan), and three commercial units in what is currently the Pitcrocknie Restaurant carpark at the right of the plan above. Future phases of development would see around 180 further houses built across the site, with new roads and landscaping throughout. The developers say that a children’s nursery and possibly shops could be included in future phases, and land immediately to the west of the site (ie, towards Alyth itself) could be available for ‘community-based projects’. 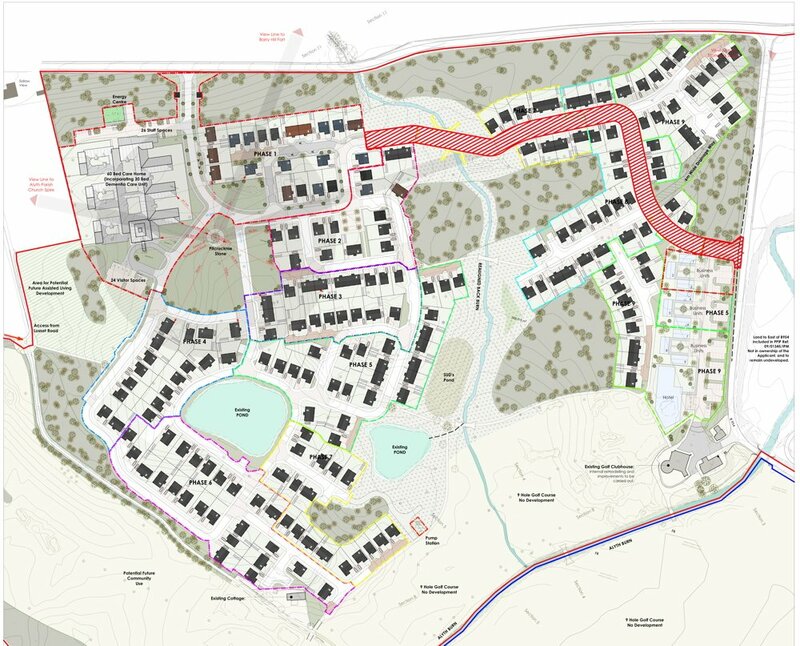 The developers claim that around 130 permanent jobs would be created for the town of Alyth alone when the development is mature, generating £3.5m for the local economy. Perth & Kinross Council are now considering the application and are due to decide in the next couple of months on whether to grant detailed planning permission. This is an artist’s impression of what the care home might look like, and below is a detailed plan of the first phase featuring the care home and 20 houses. A report highlighting ten key outcomes to ensure a sustainable future for the rural economy in Scotland has been presented to the Scottish Government following one of the biggest consultations in recent years. The consultation, which was coordinated by the National Council of Rural Advisers (NCRA), an independent body providing advice and recommendations on rural policy to the Scottish Government, took place earlier this year. 130 responses and comments were received in response to an initial discussion document that was drawn up by the NCRA following a series of workshops and events across the country. The recommendations made in the report, which is described as a blueprint for Scotland’s rural economy, include recognition of the strategic importance of the rural economy and ensuring that it is included within all policy and decision-making processes. The report also recommends developing an interim rural economic framework to provide a structure for the development and implementation of a new approach to rural policy, development support and investment. The creation of a rural economy action group to ensure that the recommendations of the report are set in place and that those involved are held to account is also called for in the report. 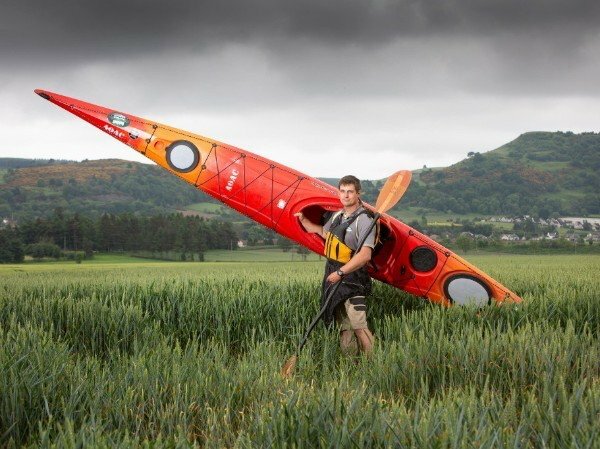 The report features Alyth’s very own Piotr Gudan (pictured above) who runs his adventure company Outdoor Explore from The Barony on Commercial Street. Two key parts of the Strathmore Cycle Network will soon be in place following Perth & Kinross Council’s approval of several new ‘Green Routes’ across the county. Green Routes are country lanes normally narrower than 4m, where 40 mph speed limits are imposed making them friendlier for walkers and cyclists. There are already 19 such routes in Perth & Kinross, and the Council has now approved five new ones, two of which are key components of the Strathmore Cycle Network. One of these includes the minor roads from Bothrie to Burnhead, and from Blacklaw to the bridge over the River Isla at Boat of Bardmony. This will connect New Alyth with the eastern end of the new multi-user path that has just been constructed by the Strathmore Cycle Network and local landowners, connecting Blacklaw with Ashgrove Road in Rattray. The other new Green Route is the network of lanes southeast of Blairgowrie linking Rosemount, Parkhead, Myreriggs, Coupar Grange and Bendochy. This will link to the proposed new multi-user path coming out of Coupar Angus and over the Couttie Bridge, completing the Blairgowrie-Coupar Angus section of there Strathmore Cycle Network. The other three Green Routes that have been approved are at Muthill, Longforgan, and Aberargie. The Council says that discussions with elected members, local communities and cycling groups indicate that the Green Routes are very popular with road users, and they’re sure that the new routes will be no different. The Council’s formal approval of the new routes will allow traffic regulation orders to be prepared and advertised, with any objections being considered by a Council committee. All being well, the new Green Routes should be a reality by next Spring. The Strathmore Cycle Network is an ambitious plan to create a £1.6-million network of cycling and walking routes designed to connect Alyth. 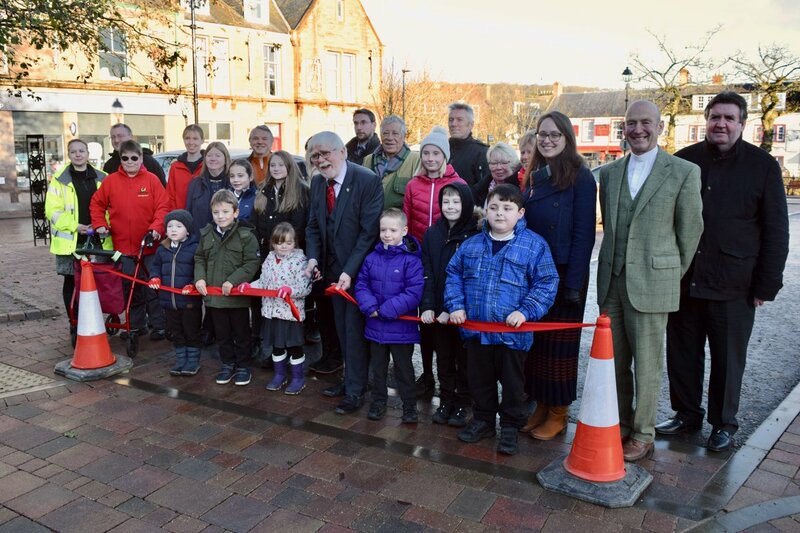 Blairgowrie/Rattray and Coupar Angus, improving road safety and helping to cut carbon emissions and pollution. 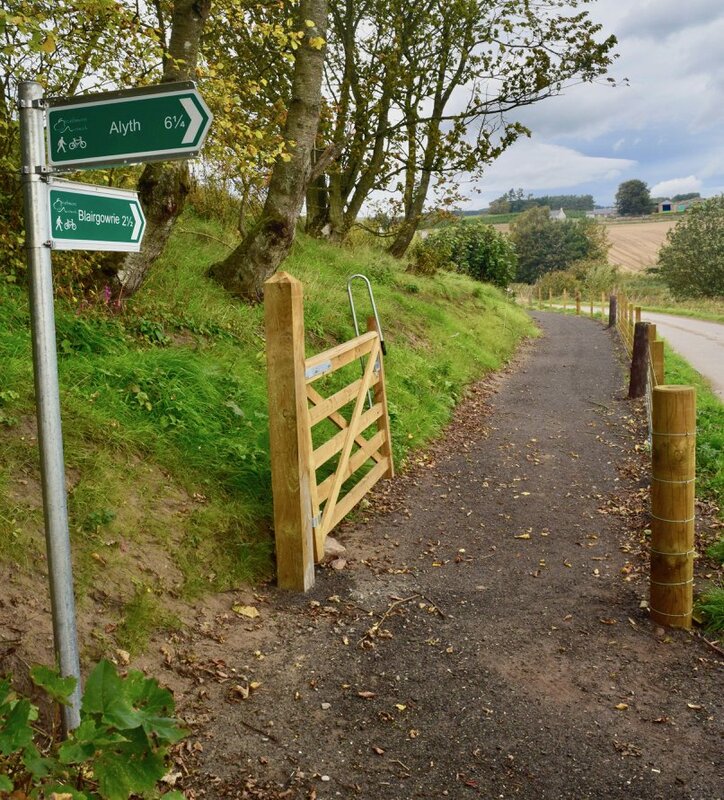 The development trusts in the three town have already raised more than £250,000 towards the total, which is being invested in the new path between Alyth and Rattray as well as the design of the new path from Coupar Angus to Bendochy. Alyth has joined forces with Blairgowrie/Rattray and Coupar Angus to create a £1.6-million network of cycling and walking routes designed to improve road safety and help cut carbon emissions and pollution. The three towns have already raised more than £250,000 towards the total, which is now being invested in new cross-country paths and bridges on the first phase, linking Alyth and Rattray and avoiding the main road. We at ADT are pressing ahead with our counterparts in the other towns on fund-raising and planning to complete what will be known as the Strathmore Cycle Network over the next couple of years. The Steering Group set up by the three trusts will hold public meetings in early September to help decide the route between Blairgowrie and Coupar Angus. The public meetings will take place at the Coupar Angus Cycle Hub (the old Strathmore Bowling Club) at 7.30pm on 4 September, and 1 Upper Alan Street (Opposite the Royal Hotel carpark) at 7.00pm on 5 September. 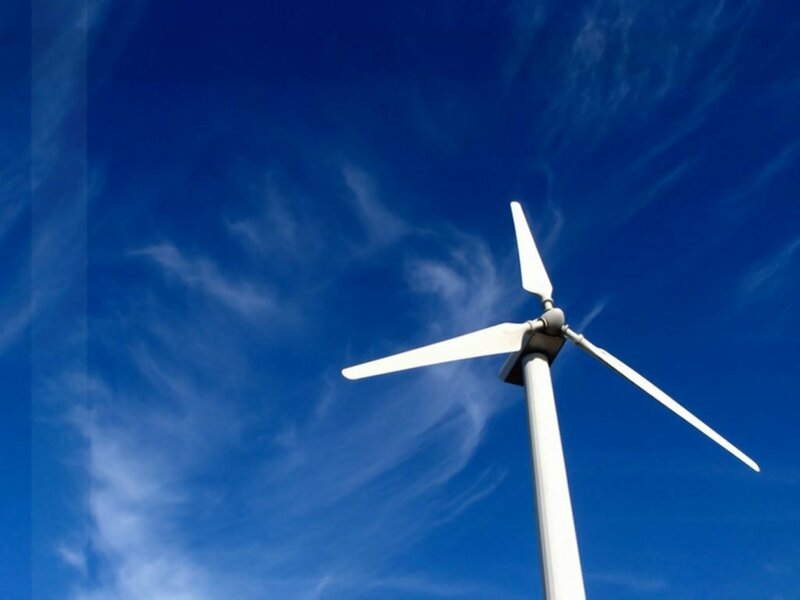 Initially, the network is using some 13km (8 miles) of existing country lanes connected by almost 11km (7 miles) of new cycle and walking paths built with the consent and cooperation of landowners along the route. The only exception to this is where it crosses the River Isla just north of Coupar Angus via the Couttie Bridge. This could involve converting the A923 at that point to a single carriageway controlled by traffic lights plus a dedicated cycle lane, along with new paths constructed north and south of the bridge away from the road. Later phases will see new paths built to bypass public roads altogether and provide dedicated direct routes for cyclists and walkers between the three communities well away from motor traffic. The project has so far secured £37,000 from the cycling and footpath charity Sustrans Scotland, £200,000 from the Scottish Government’s Improving Access for All fund, £8,000 from the National Lottery Awards for All fund, and £10,000 from Tactran – the statutory regional transport partnership covering the Angus, Dundee, Perth & Kinross and Stirling council areas. Perth & Kinross Council has earmarked a further £100,000 for the network in its recent budget. 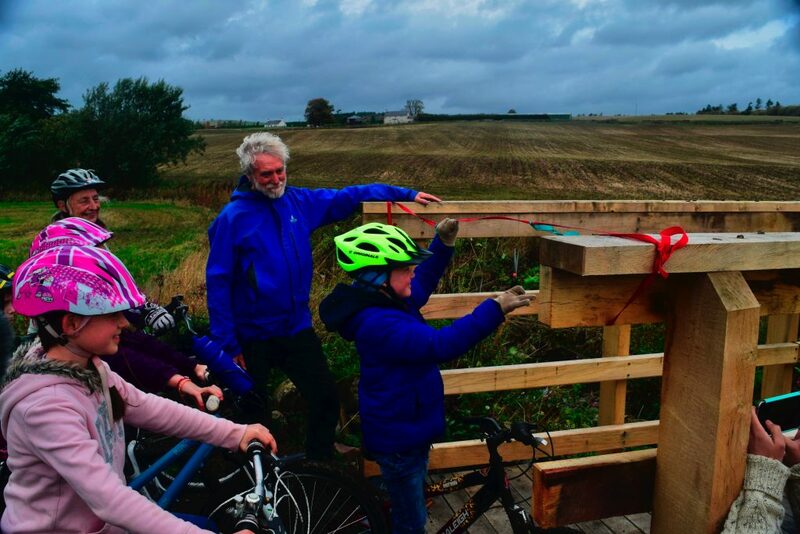 Dave Keane, Sustrans Scotland’s community links manager, commented: “Sustrans is delighted to be funding the design of a walking and cycling path between Coupar Angus and Blairgowrie which would help residents and visitors to the area using the main road which connects the two towns. The developers behind the plans for the former Glenisla Golf Course have lodged their application for detailed planning permission for the first phase of their project. 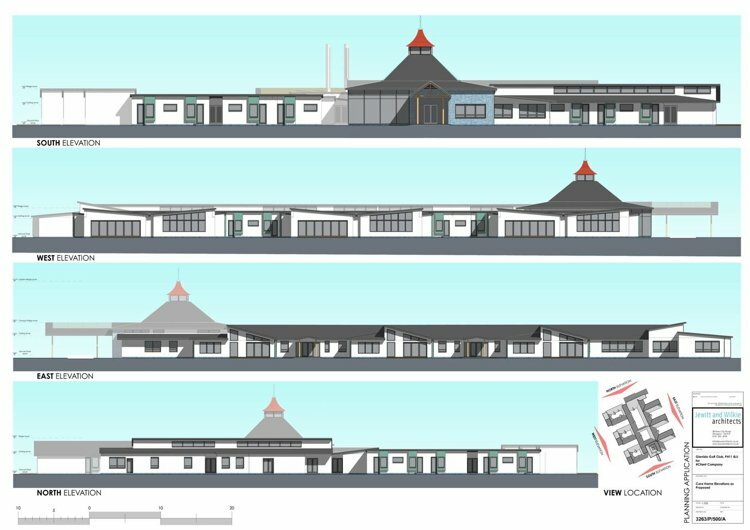 They want to build a 60-bed care home specialising in dementia care, together with 20 houses (mostly bungalows with a focus on assisted living) and three small commercial units as well as various ancillary buildings. This is the first phase of a project that could create more than 200 new homes on the former golf course, and the developers claim that this will create 175 jobs when mature, bringing £3.5m into the local economy.